"Colour Plant Remix" 2017 Peter Ojstersek. Green house 60x60x30 cm, Colour plants growing in substrate and self watering pots. 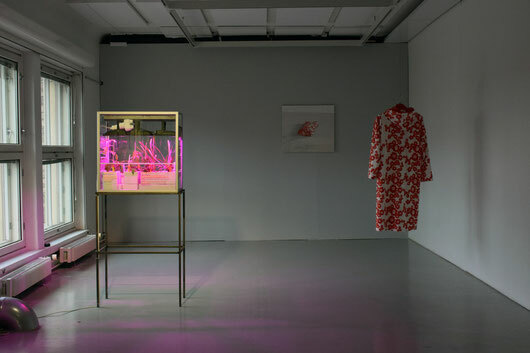 Exhibition Laboratory of the Academy of Fine Arts in Helsinki. LED light, yellow, red, green and blue text on the green house glass. Colour plant refers to plants which historicly were grown for making watercolour paint colours (pigments). ”Colour Plant Remix” is a green house with colour plants. The plants in each of the four self-watering pots can be used to process specific colours. 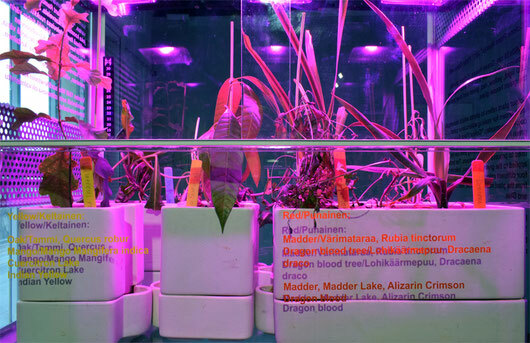 The texts applied to the green house glass, indicate the four different colours which can be processed from the plant material: Yellow, Red, Green and Blue. In the Windsor&Newton catalogue printed in 1848. about one-third of the water colours in the catalogue are processed from plant materials. for example the orginal blue colour of the Swedish flag.